Serums are one of the most potent forms of skincare products. They have a very rich, concentrated formula that penetrates deep down into the skin’s layers and starts working its magic almost immediately. 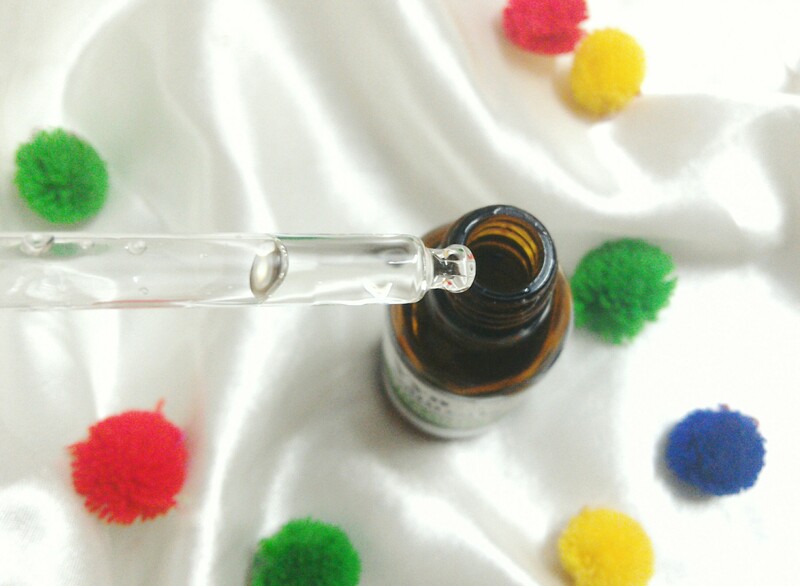 I was not aware about the concept of serums until I started to take more interest in reading about different types of skincare products and their uses. Now, I believe that a serum should be a vital part of each and every woman’s skincare routine who is in her mid 20s or early 30s because that is when your skin’s need of -something more than a moisturizer- arises! You can find serums in many variants that are made to address specific skin issues, but the ones that are made with natural ingredients ensure that your skin gets an overall boost. I recently had a chance to test out this 100% natural and paraben free serum from Vya Naturals. It is the first time that I have tried a product from this brand, they have a lot of other natural skincare products in their range which I got introduced to while surfing Amazon India. They all look very exciting, but this serum has to be the most exciting of them all as it has an interesting formula of 20% Vitamin C that claims to provide an even toned skin along with anti-aging benefits. After testing it out for almost 20 days, I am finally here to share my opinions about it! 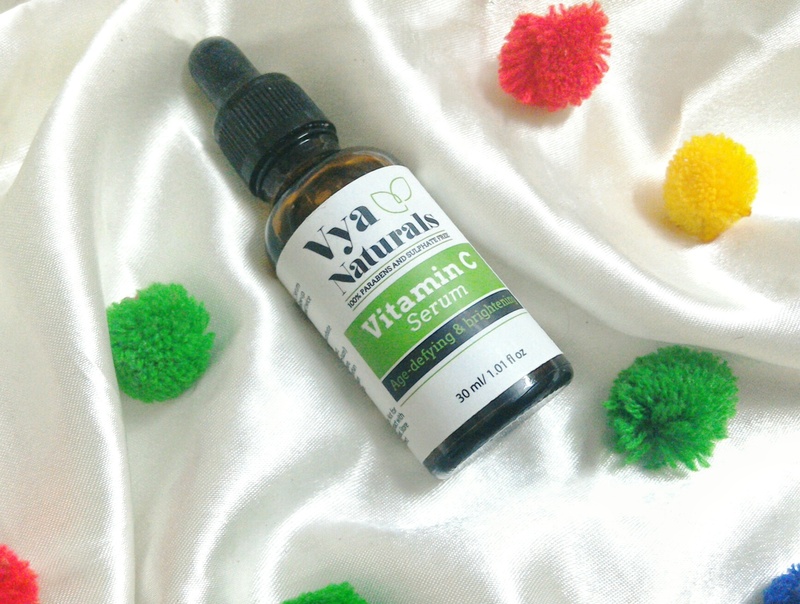 Let’s go ahead with the Vya Naturals Vitamin C Serum review! Vya Naturals products are formulated using natural ingredients that are not only safe and non-toxic but also effective. All formulations are original, created by the brand, and tested on people, not animals. Vya Naturals uses therapeutic-grade essential oils, natural plant-based butters, natural clays and plant-based waxes. And they definitely DO NOT use parabens, sulfates, artificial colors, artificial dyes, mineral oils, formaldehyde, animal ingredients, artificial scents, phthalates, chemicals, fillers, mineral oils, or petroleum. Vya is reverence for a pure and healthy life. Vya Natural’s Anti Aging and Skin Brightening Serum contains 20% Vitamin C to reduce uneven skin tone, dark spots and hyperpigmentation. Apply 1-2 pumps of Vitamin C Serum on cleansed and toned skin. Follow-up with a moisturizer. Can be used twice a day, in the morning as well as the night time. The Vya Naturals Vitamin C Serum comes in a luxurious glass bottle packaging which is housed in an outer cardboard box. The outer box contains basic information about the product like its ingredients, expiry, etc,. But the same is mentioned on the bottle as well. You must be thinking that this kind of glass packaging is just too fragile and not travel friendly, so they should have used plastic bottles instead.. But the thing is, Glass bottle packaging is the best pick for natural based products as it preserves the natural ingredients of the products and elongates their shelf life. So it is not just about the luxurious looks of the product, glass bottle packaging is quite beneficial for the product’s preservation as well! In addition to that, the dropper in the serum bottle is also a glass one. It helps to hygienically take out the exact quantity of the serum which is needed for the whole face. All in all, according to me, the packaging is really awesome, easy to use and apt for a serum! When we talk about serums, a lightweight, non-greasy, chemical free formula with potent, natural ingredients is what we want. It isn’t too much to ask for, is it? TheTheTheThe Vya Naturals Vitamin C Serum has a very light formula, perhaps, I can totally say that it is almost like that of water! It has a mild citrus-y smell that is pretty much unnoticeable. I use 3-4 drops of the serum for my whole face, you can use more or less, it just depends on your skin type. I have combination skin ever since the summer season has begun, so I use no more than 4 drops. It gets absorbed into my skin right after the application and does not feel sticky at all, unless I ever end up applying it in excess quantity. So basically the point is, try not to use the excess quantity of the serum because less is more with this product! 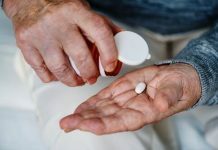 You just have to massage it into your skin for barely a couple of seconds and it will sink right into your skin without leaving a hint of greasiness or stickiness behind. The serum will instantly add a dose of hydration and nourishment to the skin while imparting a natural glow to it. I mostly don’t even feel the need of applying a moisturizer over this serum, but well, serums are meant to be used together with moisturizers and you must be aware of that fact if you know about the ultra famous 10 step skincare routine originated from Korea! The brand claims that the Vya Naturals Vitamin C Serum can be used at day time and at night time as well, but I generally use it at night, just before hitting the bed so that I wake up with a soft and glowing skin in the morning! It has Vitamin C rich formulation which bears tons of benefits for the skin. The usage of Vitamin C for skin is proven to be helpful in reducing hyperpigmentation and post acne marks. I have been using this serum from almost 20 days and I have certainly noticed that it is slowly fading away the acne scars on my cheeks. I cannot say the same about the hyperpigmentation as it may take me some more time to notice any reduction in it, I will continue using this serum and keep you guys updated. For now, I can confirm that it is definitely working on my acne scars which is a great thing for me. Moreover, it makes my skin look very healthy and glowy even when I use it under foundation or BB cream. It not only works as a serum, but also as a skin hydrating primer for base makeup. You can apply it just like all those Instagram beauty gurus apply the famous Farsali elixir in a fancy way! 😉 Perhaps, the Vya Naturals Serum would be a better option in this case due to its affordable price point (as compared to other natural elixir / serums out there) and ease of availability in India! It is a chemical and paraben free product. It is cruelty free as well! Filled with skin benefitting natural ingredients. 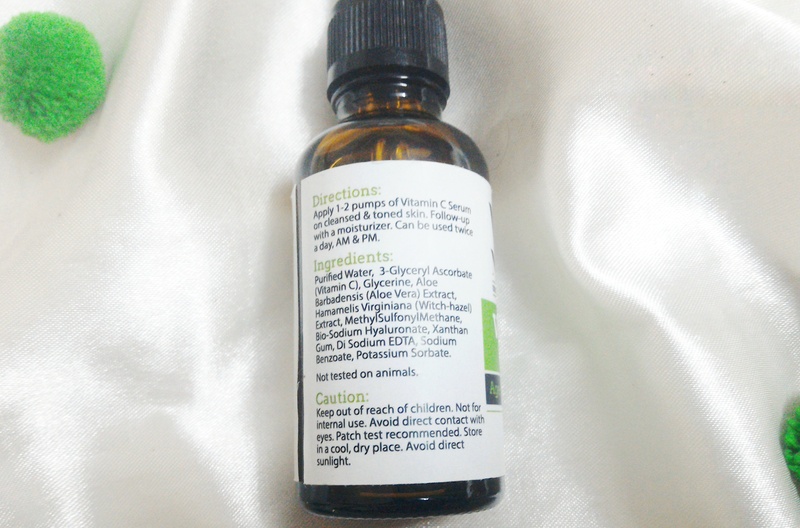 Two of my favourite ingredients – Aloe vera extracts and hyaluronate are present in this Vya Naturals Serum. Has a powerful 20% Vitamin C formula which is derived from natural resources. Its lightweight consistency gets absorbed into the skin quickly. Comes in a hygienic packaging with a dropper. Will suit all skin types due to its lightweight formula, you just have to adjust the quantity according to your skin type! It has anti-aging and skin brightening properties. I cannot comment on how well it may work on aging skin, but it is helping me to lighten my acne marks. This is not a dislike per se, but its price point may hold back some of you from buying this product. In my opinion, this product is worth your investment! I have seen a lot of serums under Rs.500-600/- range and I have gone through their ingredient list as well. The thing is, most of them don’t contain any “potent” ingredients and instead, they are full of chemicals and parabens. If you are in a hunt for a good, natural serum then you should look no further and just invest in this one! 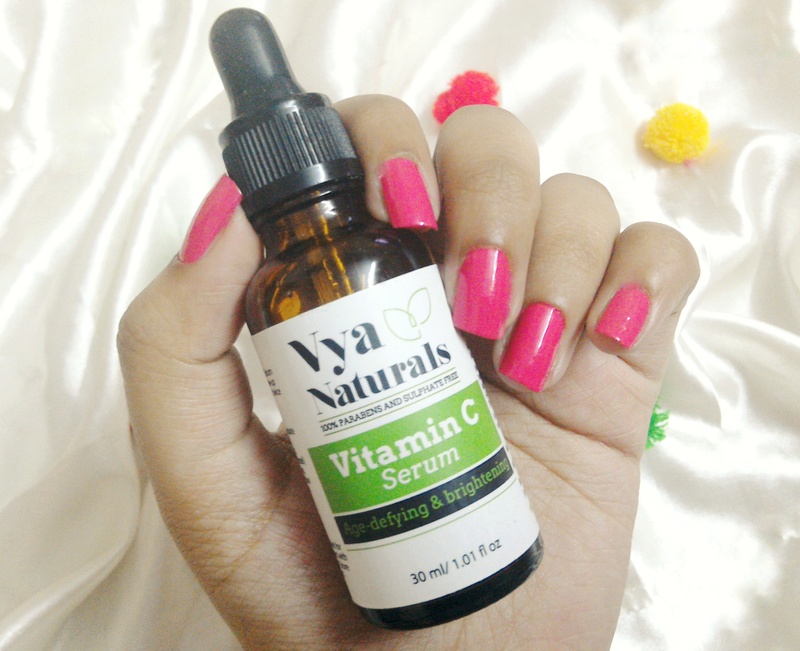 The Vya Naturals Vitamin C Serum gets a thumbs up from me! Its fast absorbing, lightweight formula that instantly revives dull skin is going to win your hearts!